Le Charivari was an illustrated newspaper published in Paris, France from 1832 to 1937. Le Charivari published caricatures, political cartoons and reviews. In 1835 the government banned political caricature, thus Le Charivari began publishing satires of everyday life. 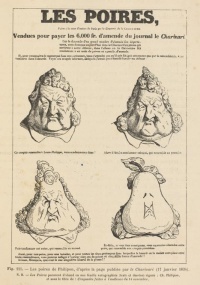 To reduce their financial risk of censorship fines with the satirical anti-monarchist illustrated newspaper La Caricature, which had more pages and printed on more expensive paper, caricaturist Charles Philipon and his brother-in-law Gabriel Aubert started Le Charivari which contained humorous, but not as political, content. Ownership of the paper changed often due to censorship, and related taxes and fines. Le Charivari published daily from 1832 to 1936, and then weekly until 1937. They also published fakes of the work of Rodolphe Töpffer in the late 1830s and early 1840s. In 1841 English engraver, Ebenezer Landells, together with Henry Mayhew, used Le Charivari as the model for their Punch magazine subtitled The London Charivari. Unless indicated otherwise, the text in this article is either based on Wikipedia article "Le Charivari" or another language Wikipedia page thereof used under the terms of the GNU Free Documentation License; or on original research by Jahsonic and friends. See Art and Popular Culture's copyright notice. This page was last modified 09:02, 25 January 2014.